I liked the looks of a recipe for Smoky Red-Lentil Soup with Cheddar Toasts; I'm always trying to assuage my guilt about eating out and/or drinking wine with little dietary inclusions I like to think (I'm deluded into thinking) cancel out the butter, the sugar, the more-than-one-glass of alcohol, and all the other good things that are bad for you. Whole-grains are one of my favorites, and really, I am glad I've learned to cook things like quinoa and bulghur, and especially beans (legumes, I know, but they seemed to be lumped in with those whole grains a lot of the time), really, I am. I like to imagine them soaking up the badness and then passing it all right out of my system the next day. Don't even try to contradict me. My old-standby lentil soup recipe is loaded with dietary problems. It's flavored with both bacon and fat-studded chorizo and contains potatoes which are now verboten, akin to pixie stick consumption. But those experts didn't get the low-fat thing exactly right, now did they? And what about calcium supplements, hmmm? Not to mention the whole carb/protein thing? So anyway, Gourmet had me out buying red lentils and chopping onions and grinding — ye gods! — 1 1/2 teaspoons of black pepper, among a few other things. The recipe did call for bacon but I decided to overlook that. It's very possible that was the crucial mistake. However, I added water and bang! Fifteen minutes later all of my lentils had imploded into a pale orange, mushy mess. I tasted it and discovered that I had just made pepper-flavored water with an amusing, brand-new texture. However, no one could eat it. No one would even try it except for me (and my husband when I forced him), and I wasn't impressed. Just cheddar toasts (add another piece of bread and you've got a grilled cheese sandwiches) were insufficient, so we made a late, I-know-it's-a-school-night excursion to the always safe and predictable Joe's Inn, with nary a whole-grain (or legume) in sight. 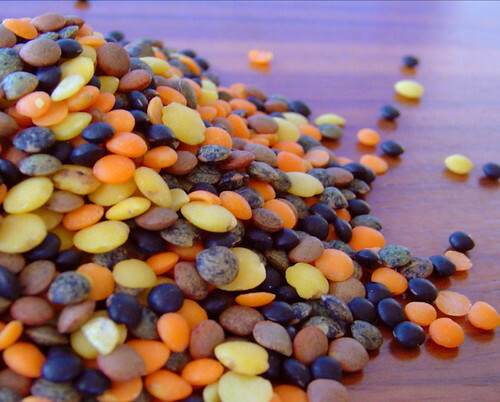 Wash the lentils and put in large pot with water 2 inches above the lentils. Add the bay leaves, parsley and bacon. Bring to a boil and simmer for 45 minutes. Saute onion, carrot, and garlic until fragrant and soft. Stir in smoked paprika and add mixture to lentils. Check water and add more if needed. Add salt, pepper, chorizo, vinegar and potatoes. Cook about 45 minutes more until potatoes are tender. Serve with a salad, bread and a good, hearty Rioja. Drink more than one glass. Serves 6 with leftovers (freezes well).